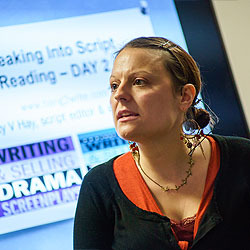 Lucy V Hay aka ‘Bang2write’ is a novelist, script editor, screenwriter and blogger who helps writers. She is one of the organisers of London Screenwriters’ Festival and is associate producer of the Brit Thriller Deviation, starring Danny Dyer and Anna Walton. Lucy has read for indie prodcos, screen agencies, investment initiatives and directors, producers, writers and filmmakers far and wide. Her debut novel, But What Next? has just been bought by Rowohlt Publishers, Germany. LSF was a great affirmation that scriptwriting is a possible reality, for everyone that attended. The sessions provided a rich source of information, direction and support.